Train No. 22461 & 22462 are in news … it runs 654 km in 12 hours has only 2 halts… 4 stations in all…. A regular Q on Quiz used to be on ‘Himsagar Express’ – once the longest but now the second after Vivek Express. Himsagar runs from Kanyakumari, the southern most part in India to Jammu Tawi – a distance of 3711 km in 5 minutes less than 70 hours. In 1898, Maharana Rana Prathap Singh first explored to connect Jammu with Srinagar. This line was later proposed in 1983 under Indira Gandhi rule and work was started. In April 2005, this line was completed up to Udhampur from Jammu side and up to Banihal from Srinagar side. Now it has become a reality with Prime Minister Narendra Modi inaugurating it on July 4,2014. A trip to Vaishno Devi is considered very sacred. Vaishno Devi, also known as Mata Rani and Vaishnavi, is a manifestation of the Mother Goddess Durga. Katra or Katra Vaishno Devi, as it is popularly known, is a small town in Reasi district of Jammu and Kashmir situated in the foothills of the Trikuta Mountains, where the holy shrine of Vaishno Devi is located. It is located 42 km from the city of Jammu. Katra has an average elevation of 754 metres (2,474 feet). 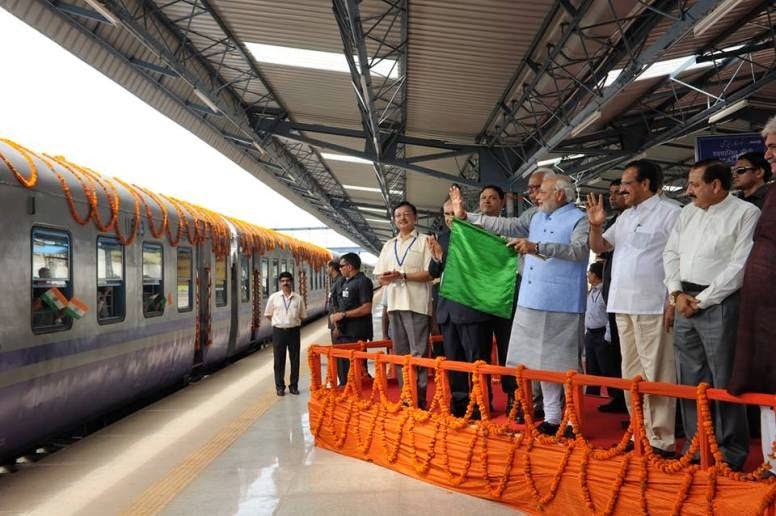 On 4th July, Sri Narendra Modiji, flagged off the first train to Udhampur, from Katra Railway Station, and spoke to schoolchildren on board the train. The train was flagged off amid vociferous chants of “Bharat Mata Ki Jai” by the children. The Prime Minister also went around the Railway Station and suggested that solar energy be used to meet the energy requirements of the station. Let Katra Railway Station be an environment-friendly, people-friendly railway station that inspires the use of solar energy, Shri Modi said. Suggesting that the train be named Shree Shakti Express, Mr. Modi, who is on his first visit to J&K as Prime Minister, said the State has gone through many “problems and difficulties” and the country wants it to be “prosperous and peaceful”. The train connectivity to Katra is part of the ambitious Kashmir rail link project that will connect the Valley with the rest of the country. The last link between Katra and Banihal pass, is expected to be completed by 2018. The 25-km long Udhampur-Katra line, commissioned after prolonged delays, has been built at an estimated cost of Rs. 1,132.75 crore. The train will traverse through seven tunnels and over 30 small and large bridges. There will be a small station — Chak Rakhwal — between Udhampur and Katra.